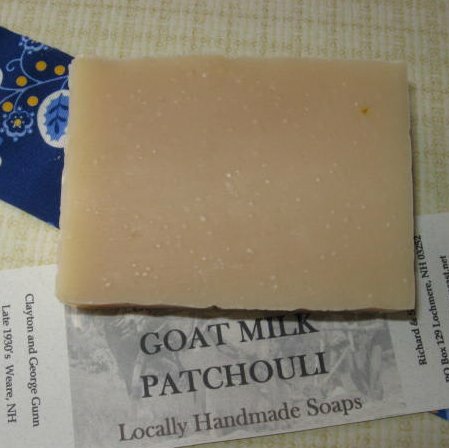 Our Goat Milk Patchouli soap holds a stronger scent of the earthy, smoky, musky essential oil. Even though patchouli's odor may be a little too persistent for some, it is often used as a fixative, base note in many of the world's finest perfumes. Other's find it an aphrodisiac. It's benificial properties are many. It is used in many anti-wrinkle products, relieves irritation from insect bites, aids in healing rough, cracked skin, and is useful for treating acne, ecxema, fungal infections and scalp disorders such as dandruff. Fresh goat milk only adds to the benefits! Ingredients: Saponified coconut, palm olive, soybean, grapeseed, and castor oils. Goats milk, and patchouli essential oil.